Canine Femoral Leg Bone Fracture FA # 2591. Optional Add-On Feature to Selected Training Manikins. An optional extra or add-on feature to either the Canine Critical Care Manikin JERRY as LFA #2570A or Canine Advanced Airway Manikin JERRY as #2602A can now be included – a long oblique fracture of the right femoral leg bone. This custom feature will allow students to learn how to set and repair common K-9 fractures. 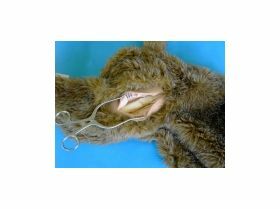 Suture Patch II is transparent to allow students to study and analyze their handiwork while allowing them to practice their suturing on a larger surface area. Mimicking the turgidity and resistance of real skin, this patch can be used repeatedly. Incisions can be made over the entire surface of the patch. Dimensions of the pad are approximately 9.5"x 6.5" x 0.5".